After the success of the Galaxy S8 and Note 8, Samsung once again finds itself holding the top spot as the biggest Android OEM in the world. But it’s not just trying to keep its die-hard Galaxy fans coming back — it’s also trying to court as many iPhone users as possible. That’s where the all-new Samsung Galaxy S9 and S9 Plus come in. The Galaxy S9 and S9 Plus are all about refinement. Design, display, photography, and performance were all strong areas for the Galaxy S8 line, and the S9 does all of them better. Here’s what you need to know about the Samsung Galaxy S9 and S9 Plus. Samsung is changing the tiers of its Galaxy lineup to be more akin to Apple’s iPhones. In the past, Galaxy S phones launched at the same time would offer similar specifications, only differing in screen size and battery capacity. The Galaxy S9 and S9 Plus have a few more differences, however. The most obvious difference here are the display sizes. The Galaxy S9 has a 5.8-inch Quad HD+ Curved Super AMOLED display with an 18.5:9 aspect ratio, resulting in a pixel density of 570 ppi. The S9 Plus has the same style of display and aspect ratio, but measures 6.2 inches. Samsung says these displays are also 15 percent brighter than the Galaxy S8. The Galaxy S9 Plus is also the more powerful option. While the S8 and S8 Plus came with basically the same internals, the S9 sports 4 GB of RAM while the S9 bumps it up to 6 GB. But the biggest difference between the two phones are the camera setups. The Galaxy S9 sports a single Dual Pixel 12 MP sensor with dual /1.5 and f/2.4 apertures. The S9 Plus offers two rear-facing camera sensors — one wide-angle at 12 MP and one telephoto at 12 MP. We’ll go into more detail on this later. For those of you hoping for a drastic change in design this time around, move along — these aren’t the phones you’re looking for. Samsung says the Galaxy S8 and S8 Plus had one of the most popular designs the company ever produced, so this year is all about refinement. The Galaxy S9 and S9 Plus sport the same form factor as the S8 line, but they’re smaller overall. That was accomplished by reducing the height of the S9 lineup and shrinking the top and bottom bezels. The S9 is about 1.2 mm shorter than the S8 and the S9 Plus is roughly 1.4 mm shorter than the S8 Plus. The fingerprint sensor is where it should be. Finally. The Galaxy S8’s and Note 8’s fingerprint sensors were in the worst locations imaginable — to the right of the rear-facing camera sensor. For a super-tall phone, that meant using it basically required shifting your hand if you ever wanted to use it. Now the fingerprint sensor is right under the single or dual camera, right where your finger naturally rests when holding the phone. While the Galaxy S8 and S8 Plus only offered minor improvements over their predecessors, the Galaxy S9 is a different story. 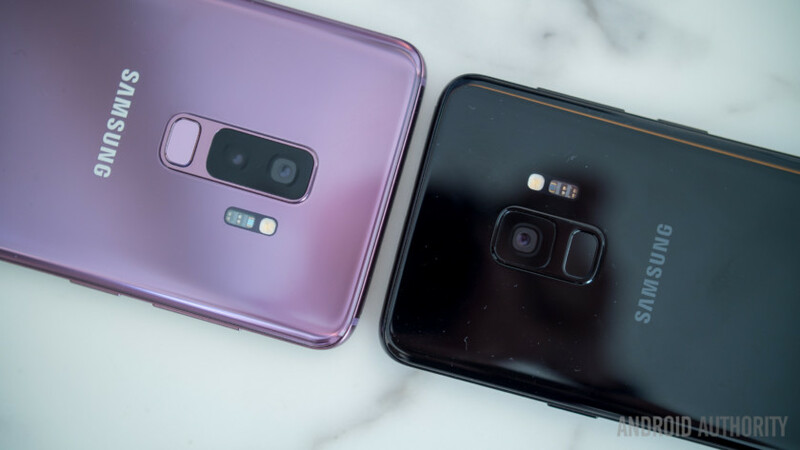 The Galaxy S9 and S9 Plus offer dual apertures in the same sensor. While the Galaxy S8 and S8 Plus only offered minor improvements over their predecessors, the Galaxy S9 is a different story. Samsung says the lens functions similarly to the human eye — when you’re taking photos in sunlight, the lens will contract and let less light in. If you’re in a dark room, the lens opens and lets more light in. In bright lighting conditions, the S9’s camera will use the tighter f/2.4 aperture, while dark lighting conditions will result in the camera using the wider f/1.5 aperture. Because the aperture is hardware based, you aren’t able to pick which aperture you’d like to use — you only get f/2.4 or f/1.5. You can choose one or the other in pro mode, but the device will pick for you in automatic mode. Samsung has also included a new Image Sensor Processor in the S9 lineup that helps process multi-frame images to aid noise reduction. It works by processing photos in groups multiple times until to create what it thinks is the best photo. The whole process happens in the background, too, so it shouldn’t slow down actually taking photos. In fact, the Image Sensor Processor has its own DRAM to handle all the processing. The inclusion of a dedicated image processor means the Galaxy S9 and S9 Plus are also able to support 960 fps slow motion at 720p. Samsung has included an automatic slow-mo feature in the camera app, so you’ll never have to think about when you should be recording — as long as you’re recording, the S9 will capture the slow-mo clips for you. Once it automatically records these clips, it’ll save the video and shareable GIFs with effects with looping and reversing effects. You can even set these GIFs as your wallpaper. Samsung is also launching its own version of Apple’s Animoji, called AR Emoji. There are two different styles of AR Emoji — a cartoon-like emoji, similar to Animoji, or a more life-like one based on a photo of you or a friend. If you decide to go the lifelike route, just snap a photo and the Galaxy S9 will allow you to customize the hair, skin tone, clothes, and even accessories. Once you’re done customizing, you can save your AR Emoji to your gallery in the form of GIFs, or add them as shortcuts to your keyboard to share quickly with friends. For many Galaxy owners, Bixby leaves a lot to be desired. From the botched rollout in the U.S. to the hardware button you couldn’t disable, Samsung certainly needs to improve its smart assistant’s public perception. With the Galaxy S9 and S9 Plus, Bixby is making the camera smarter by offering live language translation. When the camera app is open and pointing at a piece of text, S9 users can simply tap the Bixby button, and the assistant will translate the text in real time. The translated text appears as an AR overlay, and actually worked really well in our demonstration. Finally, there’s a new mode that lets you overlay makeup from Sephora or Cover Girl to see how it looks before you buy it. With the Galaxy S9 line, Samsung is combining two of its biometric security methods into one cohesive package. Intelligent Scan leverages both iris scanning and face unlock to offer a more secure, reliable way to unlock your smartphone. Intelligent scan will leverage both unlock methods for different scenarios. It defaults to iris scanning as the primary unlock method for applications requiring a higher level of security, like banking apps or Samsung Pay. For most other conditions, it’ll use face unlock. Previously, iris scanning on Galaxy phones was super secure, though often unreliable in bright lighting conditions. Face unlock, on the other hand, would have trouble recognizing the user’s face if it was too dark. Intelligent Scan should help users receive less errors when unlocking their phones. After years of tinny, bottom-firing speakers, Samsung has finally decided to focus on audio. 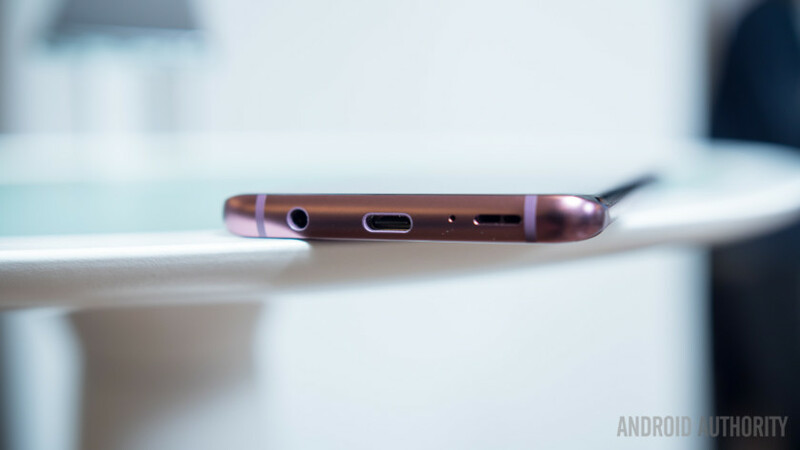 The Galaxy S9 and S9 Plus still have a bottom-firing speaker, but now also have a forward-firing speaker on the top of the device. After years of tinny, bottom-firing speakers, Samsung has finally decided to focus on audio. Samsung says these stereo speakers are 1.4 times louder than the speakers on the S8 and S8 Plus. The improvements this year come from two different partnerships — AKG, the Samsung-owned company that tuned the speakers, and Dolby, whose Dolby Atmos codec is built into the devices for better audio when using headphones. Now when you’re playing games or watching YouTube videos, you won’t have such a hard time keeping your hand from muting the audio on accident. Samsung launched the DeX alongside the Galaxy S8 and S8 Plus, allowing users to place their phones in the connected dock to power a monitor, mouse, and keyboard. It was a great concept, but it meant users had to carry around a mouse and keyboard if they wanted to travel with it. This year, Samsung is improving on its original DeX design with the DeX Pad. Now all you need to do is place your phone on the DeX Pad, and you’ll be able to use your phone’s touchscreen as a keyboard and mouse, all while displaying your phone’s interface on your monitor. The best part? It already works with every app installed on your phone. Samsung says it’s worked with a number of different app developers to optimize apps for the DeX Pad, and any developer can code for DeX using the SDK. Samsung has partnered with Square Enix to optimize Final Fantasy IV to work with a keyboard and mouse, too. You can start the game on your smartphone, then dock your phone on the DeX Pad to continue playing on a bigger display. For those who’d rather use a physical keyboard and mouse, fear not — Samsung says the original DeX dock is sticking around. The DeX Pad is just another option for users who don’t want to carry those extra things around. You’ll be able to get your hands on these bad boys in-store March 16, and pre-orders start March 2. Samsung is holding its first-ever global pre-order promotion for the phones, called Trade Up and Save. The promotion allows customers to trade in their old smartphones for credit towards a new Galaxy S9 or S9 Plus. For phones that are a year old (like the Galaxy S8 and S8 Plus), you’ll get up to $350 towards your purchase. You can still trade in phones more than one year old, though you won’t receive the full $350 credit. This offer is also available to users switching to the Galaxy S9 and S9 Plus from non-Samsung flagships. So if you aren’t so happy with your Pixel 2 or LG G6, you’ll likely get the full $350 if you decide to trade it in. Head to our pricing and availability article to learn more. That’s it — the Samsung Galaxy S9 and S9 Plus. Thoughts? Are you picking one up, or are you passing on the latest Samsung flagships? Let us know what you think in the comments.